There are many articles being written right now that are highlighting the fact that interest rates are at all-time lows but homeowners are not making application for new mortgages at as high of numbers as one might think. Homeowners don’t believe they can refinance because the value of their home is too low. The costs are too high because of all of the rate and pricing adjustments that Fannie Mae and Freddie Mac are levying. The second mortgage notes they hold are prohibitive. Some wisely hold back because they foresee a time soon that they will be selling their home and then the cost they paid and the rise in their loan amount would not be earned back in time. Rates will be rising soon and so I probably won’t have time. I’ve even heard one client tell me that they did not believe in the government stimulus, so if using the new Fannie Mae rules that allows for refinancing a lesser value home as the only way they could get it done well, then they weren’t interested. What are they serving at those tea parties!? 1. Appraised value may not be enough – should I take the risk? 2. I’m thinking about selling my home soon and moving out of the area. Should I bother refinancing? 3. My rate is 5.75% now, and I don’t think it would be worth my while to refinance. 4. I’m almost done with my debt snowball and will be working on my mortgage next. I should be able to pay off my entire mortgage within the next 7 or 8 years. Should I even bother with a mortgage right now? One of my featured posts is called “My Economy vs. The Economy”, this is the same idea. Every family’s situation is different and so there is no one right answer for every family. Over the next few days, I will write about four or five situations where I advised against my client going forward with a refinance. I’ll change the numbers enough so that no one will find themselves in the analysis – but the principle will remain. Then I’ll give a scenario where if it were different it may have changed my mind. The point in all of this is to gain the kind of depth of information that is necessary for me to put myself in their shoes and then tell them what I would do given certain assumptions if I were them. Since no two situations are alike, be sure not to find yourself too quickly in any one situation. Get the facts in your situation. If you ought to participate in the most beneficial mortgage market of all time, then don’t hesitate, rates will not wait around all year for you. But if you shouldn’t, then don’t let all the hype convince you otherwise. I made this one first because this conversation is at least a part of nine out of ten discussions with clients who are evaluating a refinance. Mr. Client (Joe) called in and said that he owed 150,000 on his mortgage. We ran the numbers, and a refinance would definitely be very beneficial. He has an interest rate of 6.75% right now. Even though he makes payments to a local bank, Fannie Mae is the lender who funded his loan – that means he could refinance even if his home is worth far less than his mortgage balance. How much less? If his home appraised for $125,000, he could still participate without bringing a lot of money to closing. A refinance could put him in a 20-year mortgage for just a few dollars more than the payment he makes on his current loan which still has 27 years left. His principle and interest payment are right around $1000. That means his savings would be $84000. Seven years of payments – 84 months X’s $1000 per month. This would make a lot of sense. But he’s concerned about his home’s value. He purchased it three years ago at the top of the market and put very little down. He knows of two homes that are about the size of his on his street that recently sold for over $100,000 – but not much over. Both of those sales were bank-owned properties, and the three homes that are currently listed for sale on his street are listed at around $115,000. He has called a Realtor and paid her to see if any homes have sold in the last 3 or 4 months that were not bank-owned and may have gone for more money. Nothing turned up. This is a rather large neighborhood that is bordered by main streets on almost all sides. We think his value would come in right around $110,000 based on the information we have. In this case, I had to tell the client that he should not bother paying for an appraisal – his home would not likely appraise for enough money to make this worth his while. Now having said that, we did discuss the possibility of his coming to the closing table with some money. Because his mortgage is owned by Fannie Mae, he is eligible for a mortgage of 125% of whatever the value is. That number would be $137,500. If Joe had $12,500 in his account and the ability to cover about $2500 in closing costs on top of that, then he might be able to get this done. He would have to move some money from his cash reserves into the equity of his home. If he has a cash reserve – and taking this money would still leave him with a minimum of three months of his expenses – then I would recommend he do it. In fact, if he did that, then he could potentially squeeze into a 15-year fixed mortgage – his payment would be just a few dollars over $1100. Then is total savings over 15 years would be around $130,000! Now that would be quite a return on $12,500. This client of mine (Joe again) is in a $250,000 mortgage that I wrote for him in 2006. It was a 15-year fixed-rate loan, and his rate is 5.875%. He put plenty of money down at the time and since he has been making payments on a 15-year clip, he has enough equity in his home to qualify for a mortgage right now even though home values have dropped in his neighborhood. The appraisal would only have to come in for $260,000 today for him to do a mortgage with no price adjustments, and with his good credit scores, the new loan would actually be slightly less expensive than when he did his last loan. In fact, this loan, rewritten at a 4.5% interest rate would allow Joe to pay off his loan in around 10 years saving him almost $50,000 in payments! Yet, he is quite sure that he will be moving soon. In fact, this fall, 2010 will be the date he puts the house on the market and aggressively tries to sell it. The closing costs of just under $2500 will not be “made back” for more than 11 months. Even if it took 6 months for him to sell the home (spring of 2011) he would barely have made back his money spent to do the mortgage. I told him to not bother, there would be no real savings in that time frame. We did talk further thought about the chances of him staying around a year longer than expected. If he would do the loan at the lower rate and then make the same mortgage payment he was making before, then two years after the loan closing, he would have paid down $7000 more if he had refinanced. The entire first year is spent making back the closing costs – but the next few years are very beneficial! If Joe thinks he might stick around, then I think he might regret it if he does not refinance now. Selling two or three years from now in his case would have saved him a lot of money. This client, like so many, are able to refinance because of the “open access” and “plus loan” programs that are available, but because their current rate is not real high and because of the pricing adjustments these programs come with the value of refinancing might be squeezed out. This client has a first mortgage of $300,000 on a home they’ve owned for a while. Two years back they finished their basement and used an equity line of credit for that – that balance is $45,000. They have seen property taxes increase on their home almost every year they’ve owned it except for the past year – this year they saw a rather large decrease in the taxable and assessed values of their home. They are hoping for a reduction in taxes. Their mortgage has only been around a couple of years because they refinanced once already since they purchased the home early in 2008. They can’t make higher payments than they are making because of a change in income and because they’re committed to paying off a few credit cards and a car loan that they still have out there. Because the appraisal of the home will be a little over $300,000, the new programs will apply to them making the refinance possible but will make their rate higher than the going rates. On the day we talked the most optimal rate/cost offering would have been 5.375% with closing costs just over $3,500. When we calculated the new payment and considering the new tax amounts, we were surprised to see that the payment would go down by more than $210 per month! At the outset, this appeared promising. Yet the internal changes to the payment needed to be looked at. The largest contributor to the lower payment was the property-tax reduction. This amount was $115 per month. Another contributor was the term of the loan. Because the current mortgage had been around for two years, it only had 28 years left. The new mortgage would have to be written for 30 years – this causes a reduction in the amount of principle deducted in every payment – another $20 per month. The interest-rate reduction contributed too – $75 per month of the total $210 payment reduction. Let’s look at the break-even point. If the cost for the refinance (even though it’s rolled into the mortgage) is $3500 and the savings is around $75 each month, then the cost is not made back for almost 4 years – 46.6 months to be exact. After having gone through each of these points and explaining that the property-tax amounts could be given by the taxing authorities and reported to the lender for a partial payment reduction based on lower escrow payments, this client bowed out. I don’t blame him. Having said that, cases like this are very prevalent, and many factors could change the situation for you: no second mortgage, a slightly higher current mortgage rate or loan amount, a slightly better appraisal of your home, just to name a few. Then there’s this important question: What’s a lot of money? If $75 is a lot to you and you plan to be in the home for the long term, then go for it. Don’t let another person’s conclusion be your conclusion. You can see in this case the importance of getting at the heart of the savings. This loan is often sold but would less often be purchased. Given a full and accurate description of what is improving and why the well-informed consumer will make a good choice for themselves. Get the facts about your mortgage. Selling is the process of understanding and educating so that there is a “putting together” of a good sales person’s product with the real needs of an informed customer. Since we have been working with Churchill Mortgage out of Tennessee, we’ve had the pleasure of speaking with listeners of the Dave Ramsey Radio Show. He airs all over the State of Michigan, and when his customers call the only mortgage company that Dave has ever endorsed they call Churchill Mortgage. Churchill mortgage has to decide how to handle changing call volume and difficult states. Last year they decided to use a preferred provider for Michigan – they called Cornerstone. When Mike Hardwick of Churchill Mortgage calls and asks if you’d like to be a preferred provider for callers of the Dave Ramsey show, you say yes and ask questions later. This has been a very good thing for us, and I trust for them as well. We’ve talked to hundreds of Ramsey Show listeners over the past few months alone! Because I know he’s a Ramsey guy I usually ask him how long he’s been listening to Dave. Then I ask him where he’s at with Dave’s seven “baby steps.” Most often the client is in step two. That means that they’ve put away $1000 into an emergency savings account. They then listed all of the debts they have except their mortgage from smallest to largest on a piece of paper. They attack, with Gazelle like intensity, the smallest debt on the list until it’s gone, and then they go on to the next one. This is called working the debt snowball. This particular client had been working his snowball down from almost $70,000 (remember, no mortgage included, just credit cards, car loans, and student loans) to around $15,000. His average monthly payment, against the smallest account only, was over $1500 every month. He now has two accounts left to pay off, a combined payment of $2000 a month for the next eight months. After I get this information, I ask about his mortgage. His mortgage balance is just over $200,000 and he has a 6.75% interest rate. The normal calculation would say that this guy should refinance because he could save 1.5% on his rate if he got 5.25%. That’s an annual savings of $3000 per year. That would make back his closing costs in the first year, and then he would be ahead $3000 per year every year following. Right? Wrong. Dave Ramsey listeners eat credit card debt for lunch and pay off auto loans for dinner. They do not stop when the consumer debt is gone. They keep going and going and going. Once the consumer debt is gone, these folks start contributing to their 401k – yes, this does eat into the $2000 snowball a little bit. They then take the remaining $1500 per month and begin over-paying their mortgage. At that pace, they would have to pay 89 payments on their mortgage in order to eliminate it. That’s about 8 years from today. So, we look at refinancing. When you apply the interest rate savings of 1.5% to a seven-year mortgage you get a much different result than if that loan is around for 30 more years. Their current payment is $1350. If you add $1500 to it you get $2850. That would be the amount this client pays every month starting in eight months, and as we’ve shown, that’s an 89-month payoff. But if he was to refinance into a 30-year fixed, add the closing costs of $2500 to the loan first, then finish his other debt in eight months (at which point he could really attack the mortgage), how long would it take him to eliminate the mortgage if he paid the same $2850 per month? The answer is – 85 months. This is a savings of four months of payments of $2850 for a grand total of $11,400 in savings. If you have more than 10 years left to pay, then your savings will be larger. If you are less sure that this client about how fast you will eliminate your mortgage, then you might want to lock in savings now because they might total more in the end. Your mortgage rate savings may be greater. You may have much longer to pay on your other debt first and the mortgage payment savings could help increase the size of your debt snowball – this would increase your savings. Get the facts and stay committed to eliminating all of your debt and payments. 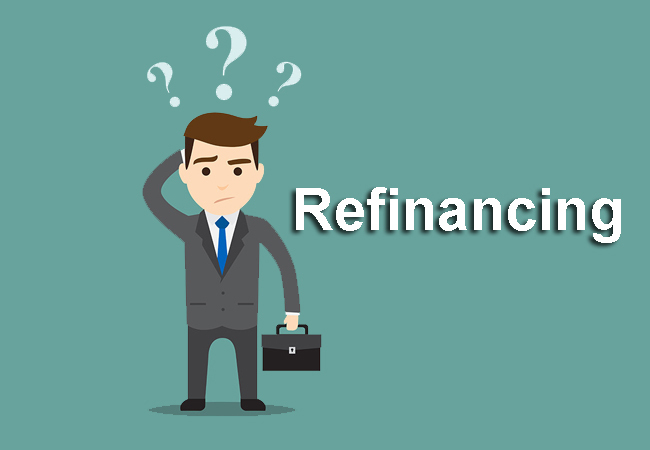 You may have heard about refinancing and you want to know more. So what’s refinancing? Basically, refinancing allows any borrower to modify his home loan especially to meet his needs. When a borrower refinances his loan, what he does is actually apply for a new loan. Then he uses the proceeds of the loan to pay his existing loan. The borrower may apply for refinancing with another lender but normally, most borrowers prefer to refinance with only one lender; their original lender. There are many possible reasons why people decide to refinance. One is because of the change in financial conditions. This may be the result of employment changes that have affected your financial status. The second common reason is this: some disgruntled borrowers also resort to refinancing just so that the can pay off and settle their debt with the current lender that they don’t like. The third possible reason is the fact that some borrowers feel that the current mortgage no longer meets his needs. Some borrowers, for example, want a shift from a variable rate to a fixed rate. Refinancing also gives people better opportunities, and this is reason number four. With refinancing, personal loans, credit cards debts, and other debts are combined. This in effect reduces the interest rates, as well as the amount of the monthly repayments. Some homeowners who are planning to renovate their homes see refinancing as a good way to do it. This can also be true for homeowners who want to build a new home. Refinancing helps by making available the equity of the home to be used for the renovation. For people who need capital for investment, refinancing can also be another way. There are, however, disadvantages to refinancing. So what are these disadvantages? If the current mortgage has a fixed rate of interest above the normal because the economy has gone bad, then borrowers may have to pay break costs. What are “break costs”? These are the costs that a borrower has to pay from his fixed interest rate for what’s left of the “locked-in” period. These costs can be very high especially if the fixed rate is higher than the existing rate. The borrower will also have to pay for what is called discharge fees from the current lender. Discharge fees can be very high most especially if the loan is still new. Are you thinking of refinancing because you want to shift from your current interest rate, from variable interest rate to fixed interest rate, for example? Be careful as this can be tricky, and you may end up losing more than you have ever imagined. If you have a fixed rate now, a variable interest rate may appear to be very attractive to you now. But what if the opposite happens? What happens if, for example, the economy improves? Here are the two scenarios: There is a chance that you will end up paying far more interest if the interest rate gets higher than what you are currently paying today. On the other hand, a fixed interest rate may also be very attractive especially if the rate is lower than what you are currently paying. But then again, what if the economy continues to fall together with the interest ratel? You could end up paying more than you have to. So, what’s next? Smart borrowers must always weight the advantaged over the disadvantages before making any decision. So if you are smart, find out as much as you can and make an intelligent decision based on facts!